Smooth and yummy...a keeper for sure. This heart shaped flan is specially for all Mommies out there...the sacrifices you made for your children...words cannot describe just four words..... God made you special ! Hope you will love this rich voluptuous vanilla custard ...crowned with a shiny burnt sugar top and surrounded by the smooth bittersweet caramel syrup . Truly a classic flan style , like what Dorie said..." You will be hard-pressed to find a dessert with a sexier, slinkier texture than this one . " Love this dessert and love my Mother's day present from my two wonderful Piggies. Thank You Piggies for the gift. 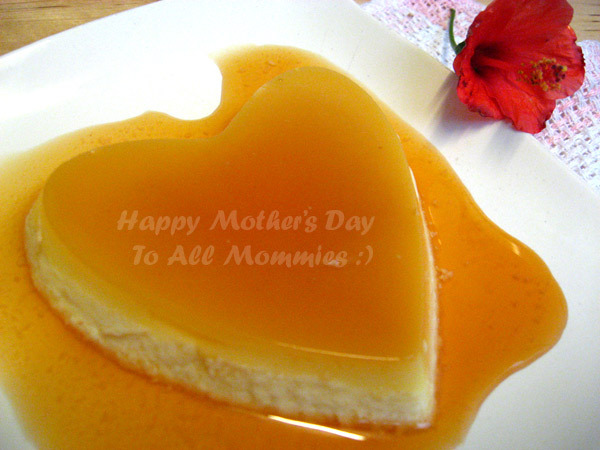 Will showcase them later :) Meanwhile here is Momsie Elin wishing all mommies a Happy & fun filled day with your loved ones . Getting ready:-Center a rack in the oven and preheat the oven to 350ºF. Line a roasting pan or 9″x13″ baking pan with a double thickness of paper towels. Fill a teakettle with water and put it on to boil; when the water boils, turn off heat. To Make the Caramel:-Stir the sugar, water and lemon juice together in a small heavy-bottomed saucepan. Put the pan over medium-high heat and cook until the sugar becomes an amber-colored caramel, about 5 minutes-remove the pan from the heat at the first whiff of smoke. -Remove the cake pan from the oven and, working with oven mitts, pour the caramel into the pan and immediately tilt the pan to spread the caramel evenly over the bottom; set the pan aside. 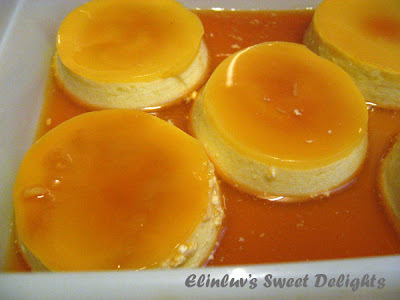 To Make the Flan:- Bring the milk and heavy cream just to a boil. -Meanwhile, in a 2-quart glass measuring cup or in a bowl, whisk together the eggs, yolks and sugar. Whisk vigorously for a minute or two, and then stir in the vanilla. Still whisking, drizzle in about one quarter of the hot liquid-this will temper, or warm, the eggs so they won’t curdle. Whisking all the while, slowly pour in the remainder of the hot cream and milk. Using a large spoon, skim off the bubbles and foam that you worked up. -Remove the roasting pan from the oven, transfer the cake pan to a cooking rack and run a knife between the flan and the sides of the pan to loosen it. Let the flan cool to room temperature on the rack, then loosely cover and refrigerate for at least 4 hours. -When ready to serve, once more, run a knife between the flan and the pan. Choose a rimmed serving platter, place the platter over the cake pan, quickly flip the platter and pan over and remove the cake pan–the flan will shimmy out and the caramel sauce will coat the custard. 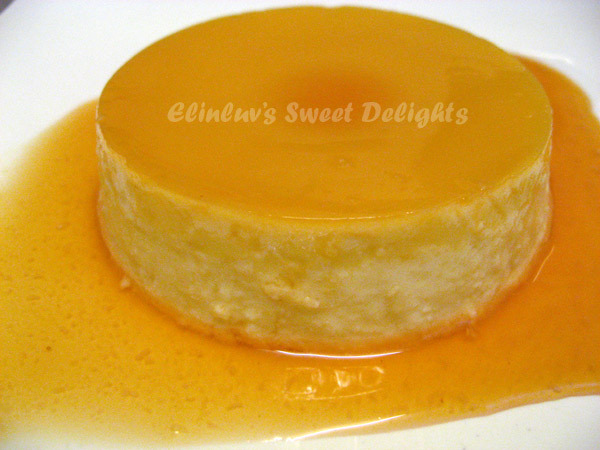 Storing: Covered with plastic wrap in its baking pan, the flan will keep in the refrigerator for up to 2 days. However, once unmolded, its best to enjoy it the same day. Serving: Bring the flan to the table and cut into wedges. Spoon some of the syrup onto each plate. Have a blessed and fun filled day with the family ! Such gorgeous flans, Elin! Anything topped with caramel wins my affection...yum. wow..sweet delight! Happy mum's day! 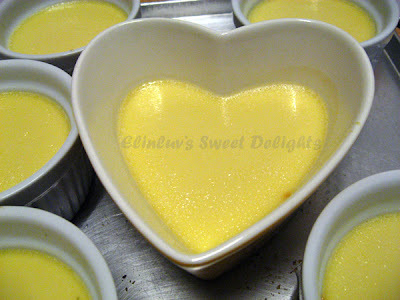 oh elin, i havent made this type of custard before..i must learn it someday! Oh yum... that is gorgeous! Happy Mother's Day to you, too!!! I have a heart shaped flan dish toooooo! This looks great! Just stopping by to give you the Versatile Blogger Award! Please stop by http://kimberliskitchen.blogspot.com/2011/05/i-won-versatile-blogger-award.html to collect it! Happy Sunday! 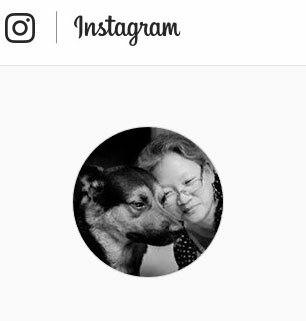 Absolutely gorgeous flans, Elin! I hope you had a fabulous Mother's Day. I really appreciate your sweet comment on my blog. I thank your for your kind words. Lora and I had the best Mother's Day...ever! Happy belated mother's day. Hope you have a blast. 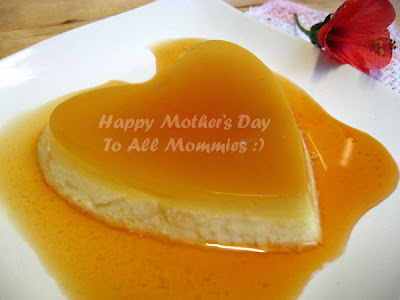 The heart shape flan is so appropriate for mother's day celebration. That looks wonderful. I love flan. @ Lizzy...:) mee too love anything with caramel topping! @ Lena...yea your gals will love it..definitely ! Elin, have yet tried making any flan. Must try it out one day. Lora....yea Elisabeth told me she had a wonderful time with you and family :) Mine was great too : Hugs and muax..great to know you are fine now :))) so happy ! Elin - you are amazing! 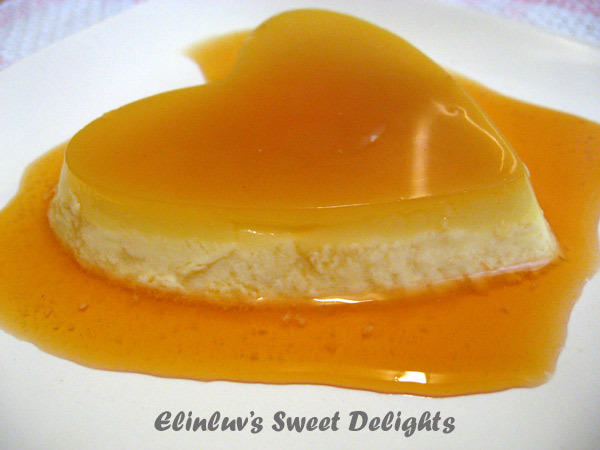 Your last heart shaped flan is so pretty. I'm always so impressed with my fellow bloggers that make desserts. I just don't have a knack for dessert making.